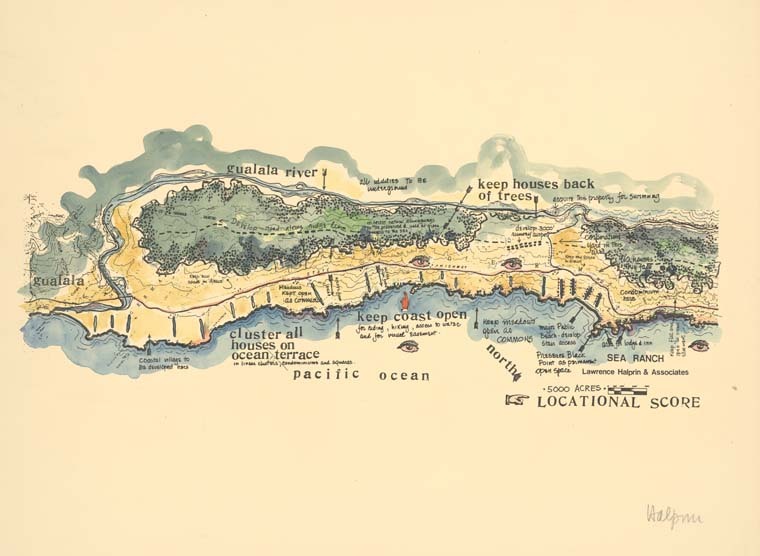 Lawrence Halprin, Sea Ranch Locational Score for The Sea Ranch, 1981. 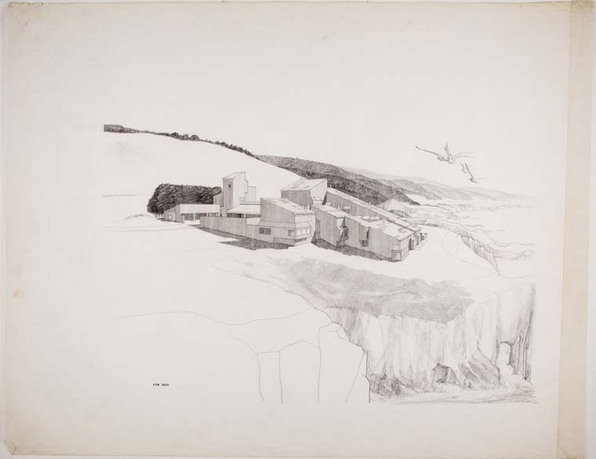 Courtesy of Lawrence Halprin Collection, The Architectural Archives, University of Pennsylvania. 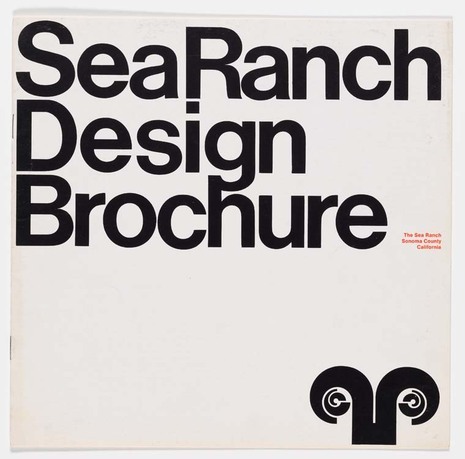 The Sea Ranch is a planned community in Northern California designed by a collective of local architects and designers in the early 1960s who challenged the status quo of suburban development. Located on the coast north of San Francisco, The Sea Ranch master plan was established by landscape architect Lawrence Halprin who, along with developer Alfred Boeke, brought together Bay Area-architects Joseph Esherick and MLTW (Charles Moore, William Turnbull, Donlyn Lyndon, and Richard Whitaker) to design the first buildings, and Barbara Stauffacher Solomon to create the graphic identity. Attorney Reverdy Johnson joined the group to concretize the community’s design guidelines, which are still in use today. SFMOMA’s exhibition gathers original designs and images that have never been shown together. The community remains exemplary as contemporary designers, planners, and developers are rethinking the balance of environmental impact, social progress and economic benefits for planned communities. Jennifer Dunlop Fletcher, Helen Hilton Raiser Curator of Architecture and Design at SFMOMA, is cocurating the exhibition The Sea Ranch. Recent curatorial projects include Noguchi’s Playscapes (2017), Model Behavior (2016), Typeface to Interface (2016) Lebbeus Woods, Architect (2013); and The Utopian Impulse: Buckminster Fuller and the Bay Area (2012); as well as commissioned installations by Bureau Spectacular (2017), Claudy Jongstra (2016) and Mike Mills (2013). She has been with SFMOMA since 2008. Dunlop Fletcher has published essays on the practice of Snøhetta, A. Quincy Jones, Ewan Gibbs, Tobias Wong, and Lebbeus Woods. She builds SFMOMA’s architecture and design collection with an emphasis on transformative works of design from 1980 to the present, including seminal works by Neri Oxman, Ant Farm, Neil Denari, and Takashi Igarashi. Dunlop Fletcher holds an MA in curatorial studies of contemporary art from Bard College, and an MA in architecture history and theory from Harvard University. Joseph Becker, associate curator of architecture and design at SFMOMA, is cocurating the exhibition The Sea Ranch. Recent curatorial projects include Get with the Action: Political Posters from the 1960s to Now (2017–18), Tomás Saraceno: Stillness in Motion–Cloud Cities (2016–17), Typeface to Interface: Graphic Design from the Collection (2016), Lebbeus Woods, Architect (2013–14), and Field Conditions (2012). Becker has been with SFMOMA since 2007, and is responsible for many major acquisitions for SFMOMA’s architecture and design collection. Becker is a contributing author to publications in design, art, and architecture, and in 2016 was selected as one of Artsy.net’s 20 Most Influential Young Curators in the United States. He received both his bachelor’s of architecture and his master’s of advanced architectural design in design theory and critical practice from the California College of the Arts, where he has been a visiting professor. Since its founding in 1935, the San Francisco Museum of Modern Art (SFMOMA) has been dedicated to making the art of our time a vital and meaningful part of public life. For that reason the museum assembles unparalleled collections, creates exhilarating exhibitions, and develops engaging public programs. In all of these endeavors, SFMOMA is guided by the enduring commitment to foster creativity and embrace new ways of seeing the world.